Exclusive MTF RSI with TMA Bands take advantage of Exclusive RSI. Using “TMA Bands” an price channels that automatically adjust to changes in volatility is a major strength of our overall system. The polynomial regression style price channels to identify optimal entry points, profit target locations, and trend direction guidance. 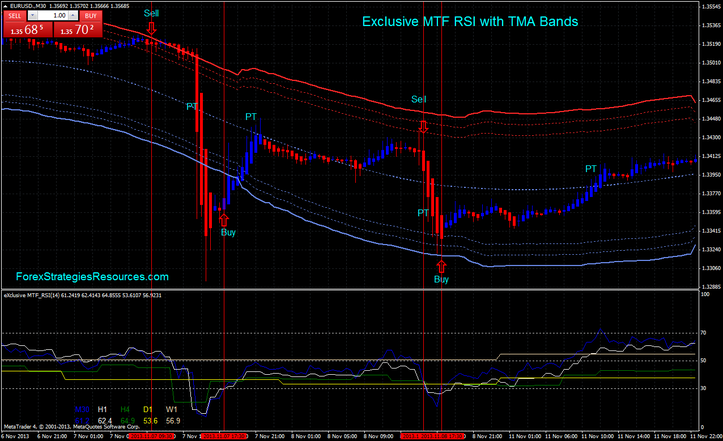 The integration of the TMA Bands with Exclusive MTF RSI, determine to an efficient trading method. TMA Bands l to differentiate the best BUY and SELL zones, with the pin-points BUY side entries off the lower blue channel zone and pin-points SELL side entries off the upper red channel zone. Exclusive MTF RSI determine the entry point when crosses down with the price in sell zone. Exclusive MTF RSI determine the entry point when blue line crosses up the withe line with the price in buy zone or the price touches buy zone. Exclusive MTF RSI determine the entry point when blue line crosses down withe line with the price in sell zone or the price touches sell zone. Initial Stop loss 30 pips -50 pips depends by time frame. Profit Target at the midlle line or with profit target predetermined. Note: The Exclusive MTF RSI is an indicator that if applied at the trading method based on the polynomial regression, makes it more efficient this trading method.